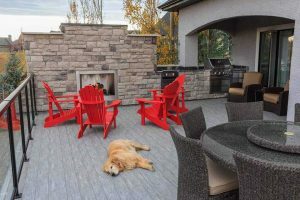 Custom deck with beautiful fireplace and outdoor kitchen. - Curb Design Inc. Custom deck with beautiful fireplace and outdoor kitchen. Glass railing on the sides. Sleeping golden retriever dog on the deck.